The 2019 International Builders’ Show in Las Vegas is right around the corner! In fact, it’s less than two weeks away and multiple Atlanta-based industry professionals are putting the final touches on their education sessions. This three-day event is the homebuilding industry’s largest conference and convention, and a major part of the show is education – there are typically more than 130 sessions each year! One Atlanta professional presenting at IBS is Courtney Rogers, Senior Account Manager at Denim Marketing. Courtney will present two sessions – a Tech Bytes educational session and a PWB Sound Bytes session with three other industry leaders. Courtney’s first session will take place Tuesday, February 19 at 10:30 a.m. in the Tech Bytes Room, South 229. 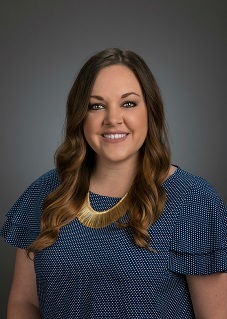 The session, titled Keep It Local: Hyper-Local Blogging, will be presented alongside Heather Schreiner, General Manager and Interior Designer at Associates in Building + Design, Ltd., a design-build firm in Northern Colorado. The Keep it Local session focuses on how writing hyper-local content is a huge benefit for your buyers, and for you! Potential buyers are looking for homes in specific areas, not an entire metro area. Providing relevant, highly localized content for those buyers, like builder Highland Homes in Central Florida does, means home shoppers get specific information pertaining to the community they’re interested in, helping them along in the decision-making processing and offering an easy way to find the builder’s homes no matter what city the homes are in or near. Design-build firm Associate in Building + Design shares content that is relevant to the design-build process and how they work with their clients in the local Fort Collins, Colorado area. The quality content produced by these builders attracts both buyers and search engines and serves as the foundation of the social media program as well. Attendees will gain valuable insight into creating hyper-local blogs to attract potential buyers, how to create a content plan focused on your target buyers and gain insight on how to use content for a successful SEO and social media program. This is a presentation that all builders, sales and marketing professionals need to hear! 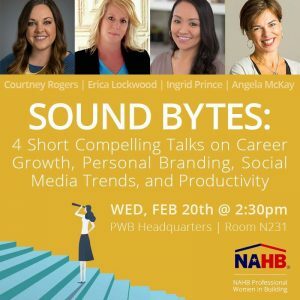 The second session Courtney presents at IBS is part of the PWB Sound Bytes program, and takes place Wednesday, February 20 at 2:30 p.m. in PWB Headquarters, North 231. The hour-long Sound Byte session features four 15-minute, high-energy presentations sure to leave you with key takeaways you can use to improve your business and personal productivity. The full session will encourage you to ask yourself questions such as: Do I really need to be on Snapchat to grow my business? How do I position myself with a personal brand others want? Is it possible to declutter my space and mind so I’m more productive? What are the steps I need to take to overcome obstacles that are holding me back from my next big opportunity? Courtney will spend her 15 minutes discussing which social media sites are key for your business and which ones can be left behind, helping you to prioritize the sites you focus on. She’ll also cover social media advertising, giving a few key tips that will help you become even more effective at what you’re doing on social media. Be sure to add these sessions to your show planner. We hope to see you in Las Vegas at the 2019 International Builders’ Show!